Whether you’re renovating, or building a brand new kitchen, you’ve just made the decision to transform the most important room in your home. 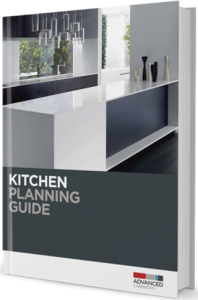 There are several steps to take that will help make the whole kitchen design process enjoyable, stress-free and exciting. The first step toward bringing your ideal modern kitchen to fruition is kitchen planning. Figure out why you are now making this investment of your time and resources. Are you planning on selling your house soon and simply want to increase its market value with a stunning new kitchen? Are you in your dream home and want to open your kitchen up so it will flow wonderfully into the adjoining rooms? Or are you improving your kitchen because you just love to cook and you want the modern kitchen space to be both functional and inspiring? Take the time to create a list of the features you absolutely must have. Undoubtedly, these will be the things that compelled you to start thinking about improving your kitchen. Whether it’s a magnificent island with chairs for socializing or its a new oven so you can enjoy a delicious roast dinner more often, these must-haves will become the inflexible fundamentals of your new design. Set a budget. Even if the sky’s the limit, establish a budget on what you’re willing to invest in this project. Just because you can afford the top-of-the-line products for every aspect of your new kitchen, this doesn’t mean that you need to. Often, less is more. Of course, investing in the best the first time around will certainly save you grief. You’ll be spending a lot of time in your new kitchen: those new drawers, cabinets, and appliances will be opened and closed countless times throughout the years. By investing in good-quality and good-looking hardware and finishes upfront, the functionality and beauty of your modern kitchen will sustain the test of time. Ready to start planning your new dream kitchen?